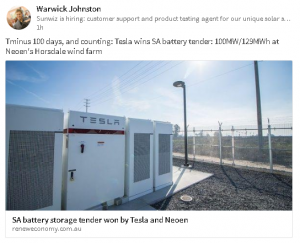 Coincidentally following close on my analysis of high Q2 2017 wholesale prices across all regions on WattClarity yesterday and the follow on coverage elsewhere, it was very topical that the South Australian Government would award its much-talked-about 100MW battery project today, to Neoen and Tesla (to be constructed onsite at Hornsdale Wind Farm). As I noted back in March, Elon Musk is (rightfully) seen as a Marketer Extraordinaire – hence I suspect that there will be many (including me) who watch with keen interest to see whether they can deliver on what they very publicly promised. If we were to count as Day 100, that makes gives us a deadline of Sunday 15th October 2017. However, one of our canny readers has picked up this snippet on the ABC that notes “Mr Musk’s ‘100 days or it’s free’ pledge starts once the grid interconnection agreement has been signed.” which means we will have to watch out for that announcement. However there is also the promise that it would be operational before the start of summer. Assuming this means 1st December 2017 (i.e. and not 1st Jan 2018) and working back 100 days, this means that Elon would be seeking to have the network agreement sorted before 23rd August, to give Tesla (and Neoen) the full 100 days to deliver. Not pocket change at stake, even for a billionaire! Personally, I will also watch with keener interest to see what emerges in terms of specifically which of South Australia’s problems this particular installation is being purchased to solve. Back in October 2016, The Australian Financial Review posted this article reviewing developments in renewable energy and smart grid technology. The journalist, Ben Potter, profiles Troy Hart and his family’s home in Adelaide’s Salisbury Heights which contains a Tesla Powerwall….